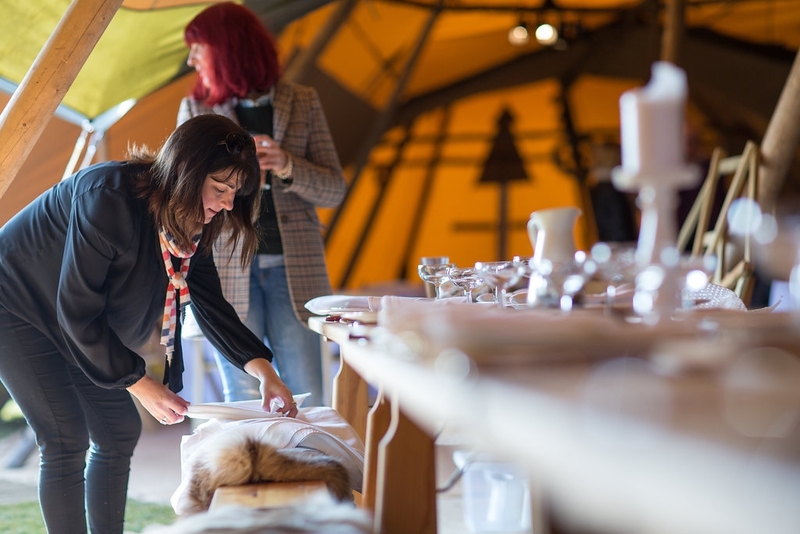 Fall in love with natural scandi vibes, an alternative wedding venue and some sensational style inspiration notes from our Fizzy Stylist Bridget, plus talented photographer Thomas Frost and a handful of incredible local wedding suppliers. 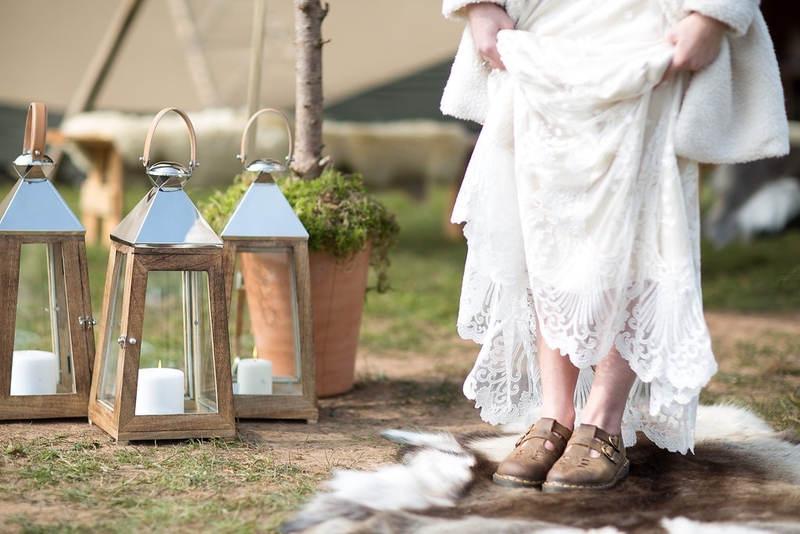 Be inspired by Bridget’s vision and how she’s collated many elements together to bring this Natural Scandinavian Spring Wedding Shoot to life… beautifully! 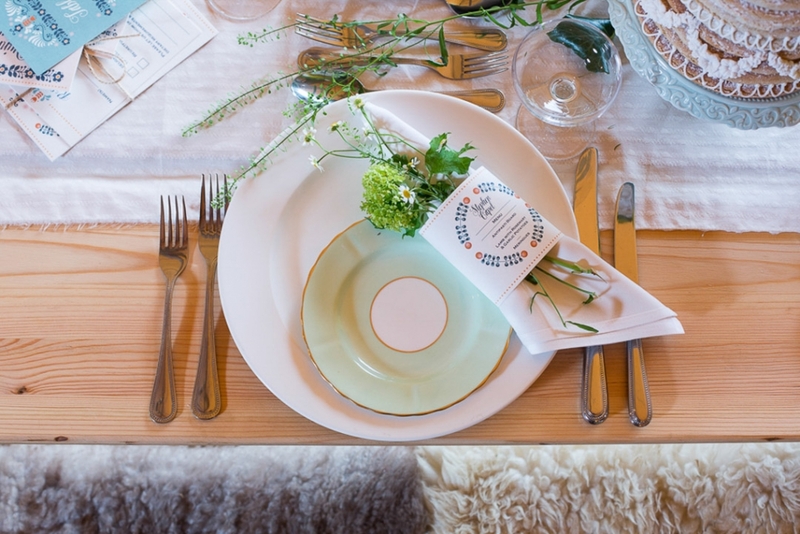 Tracy and I carefully selected a fabulous team to bring together our vision of Scandinavian Spring. 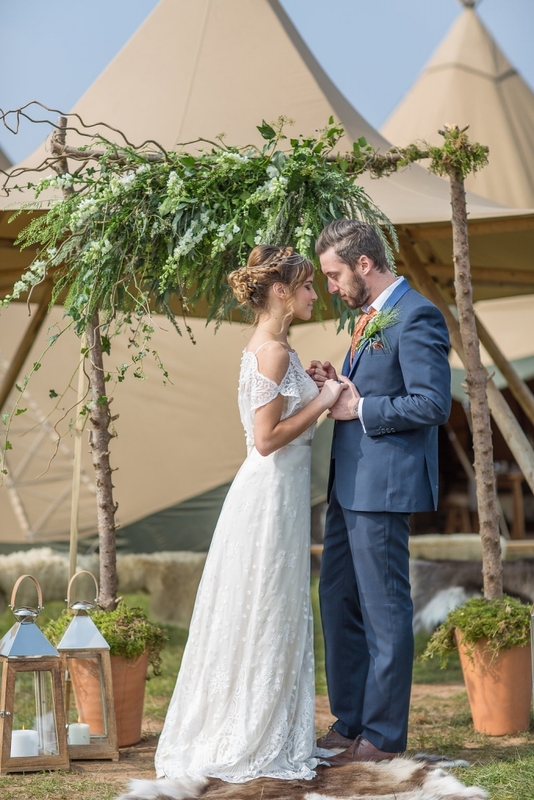 I composed a colour palette for the shoot with the wood and canvas backdrop in mind, accenting with Scandinavian blues, gentle shades of tangerine, creams and neutrals combined to give a fresh, modern yet timeless look based on Nordic inspiration. 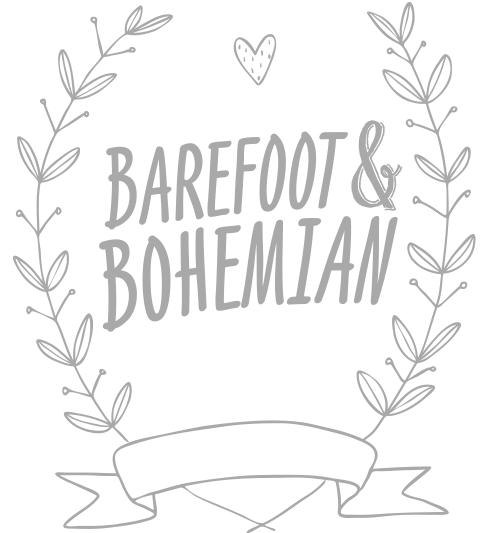 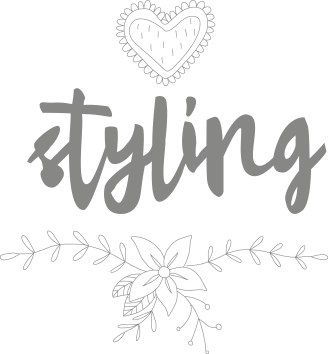 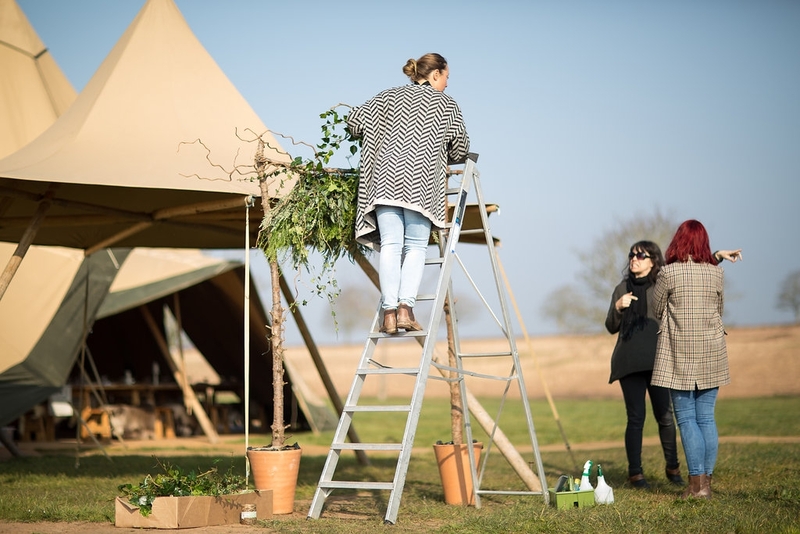 Need a helping hand styling your wedding venue? 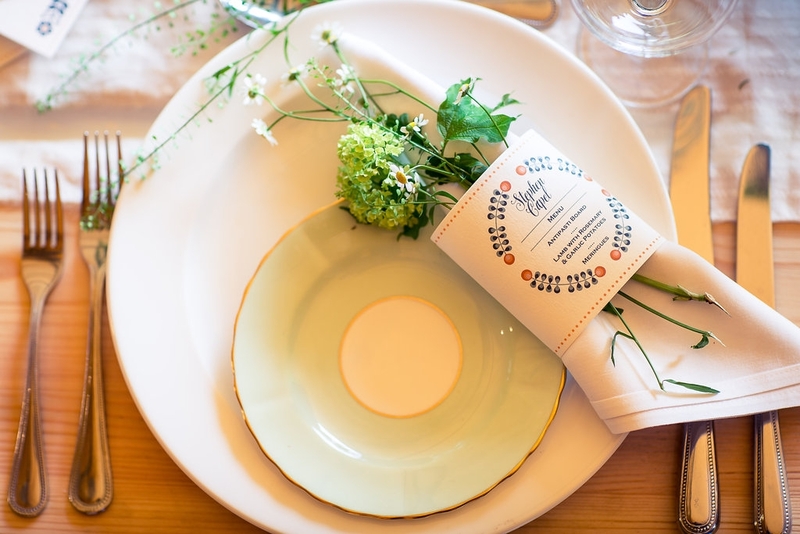 I created organic cotton runners and napkin rings from vintage fabric with a simple motif that combined my colour references and the unfussy look I hoped to achieve. 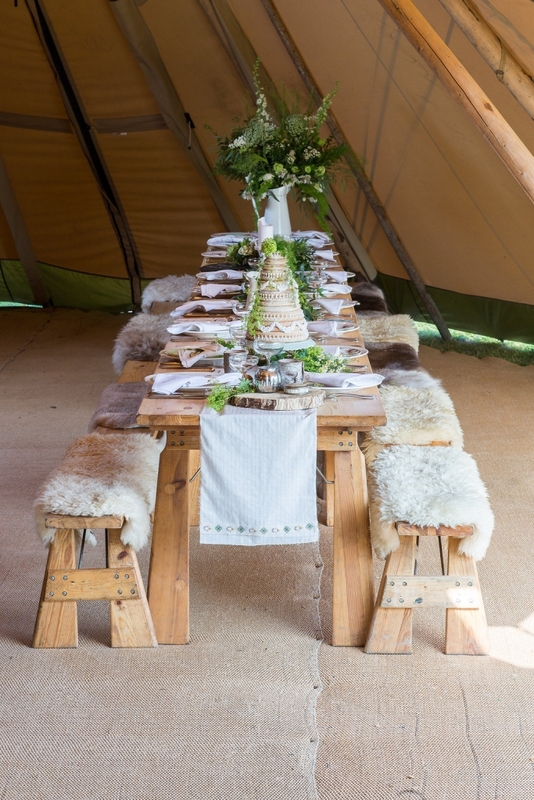 I used a combination of log slices, cream enamel jugs, white lanterns and delicate votives informally arranged on the long trestle tables punctuated with floral arrangements. . All table styling items are available from Blue Fizz Events hire range. 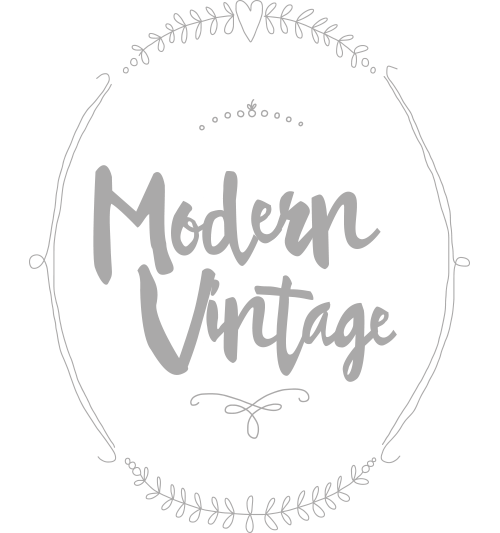 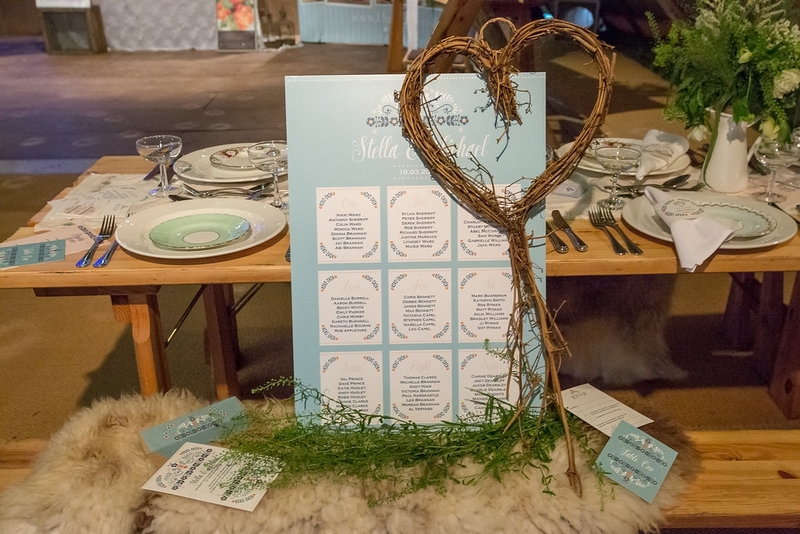 Our tables were given an extra flourish by South West Event Hire, who provided a selection of vintage crockery, combined with simple white plates, all slightly mismatched and working with the palette beautifully. 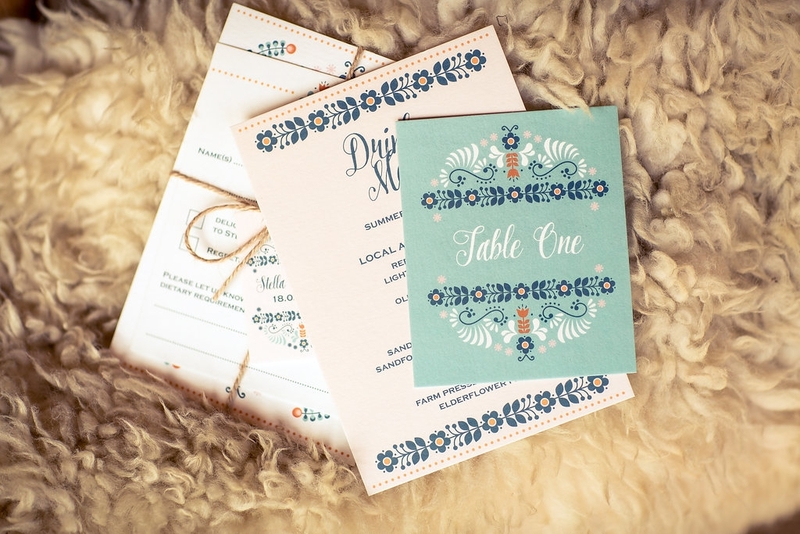 The stationary was created by the brilliant Nikki at Knots and Kisses who carefully combined the motifs and colours I had as inspiration into a clever design for napkin rings, table plan and matching stationary that sat perfectly with my ideas for the shoot. 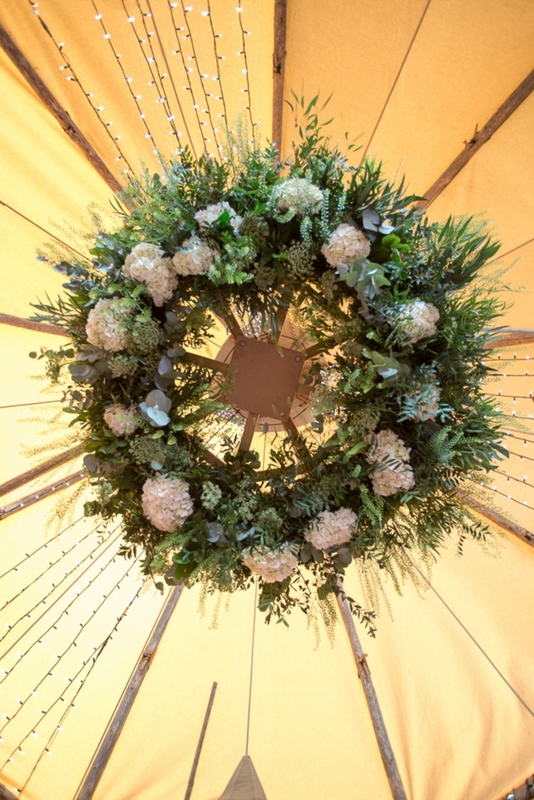 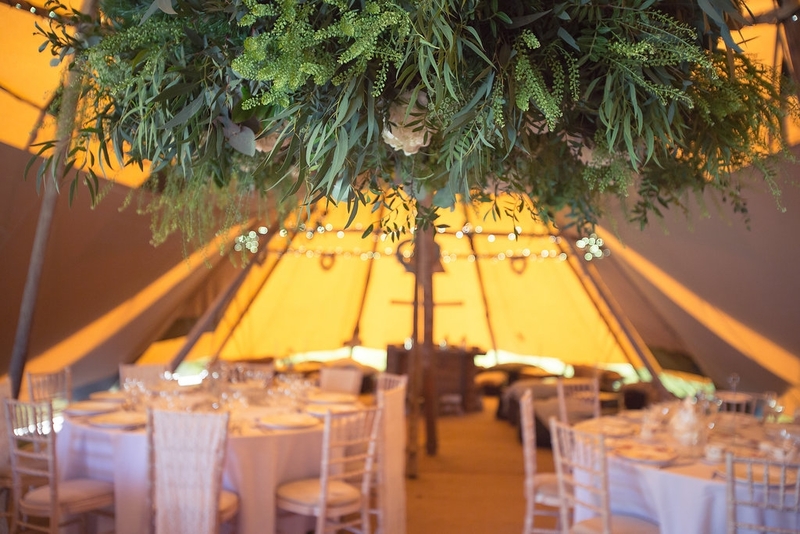 The first bouquet, arch and stunning centre piece suspended from the top of the tipi, were created by fabulous florist Emma Urquart at Brompton Buds. 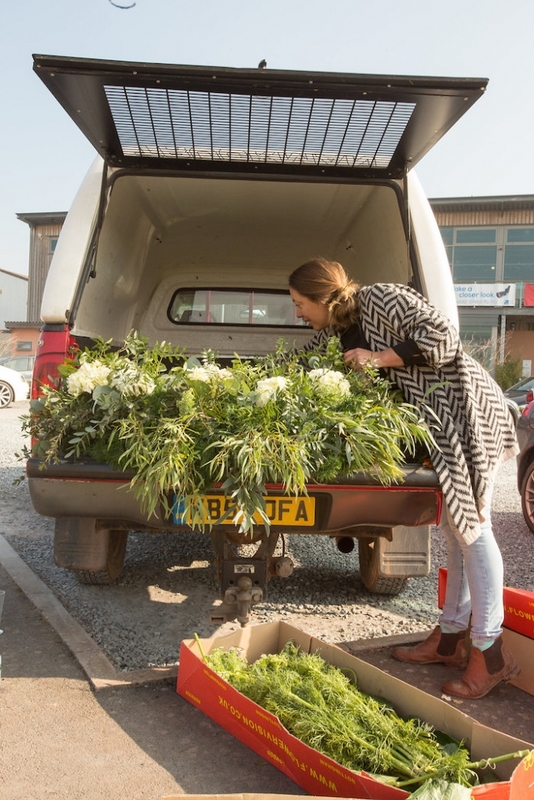 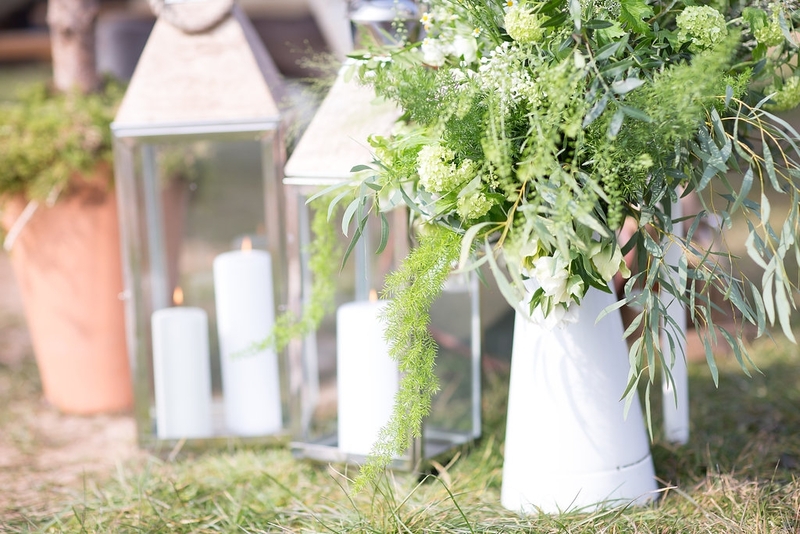 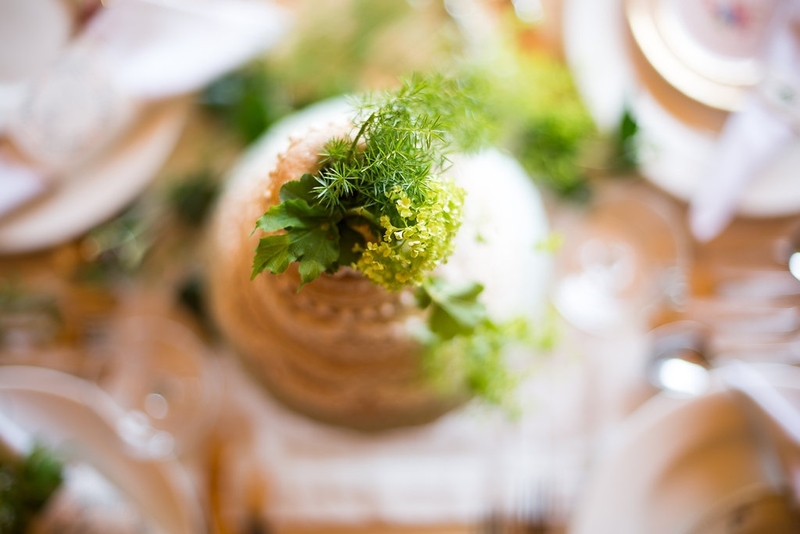 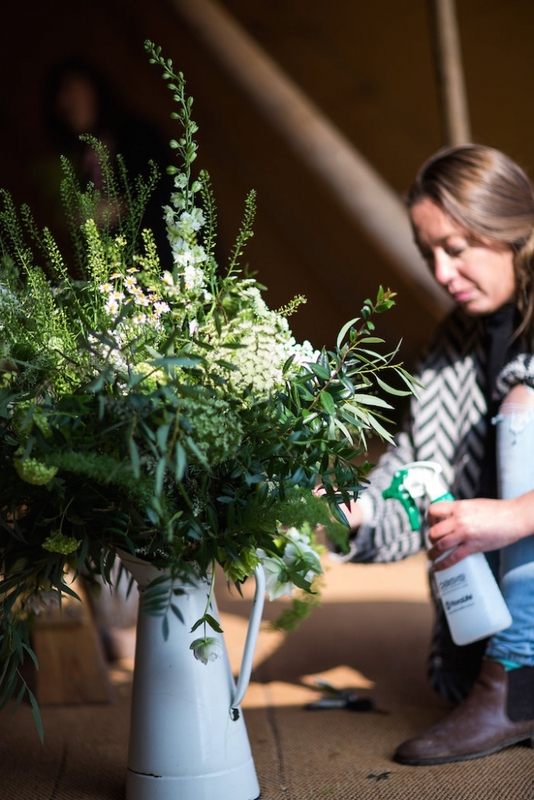 Emma has a flair for using an abundance of greenery to create a meadow like feel with informal arrangements. 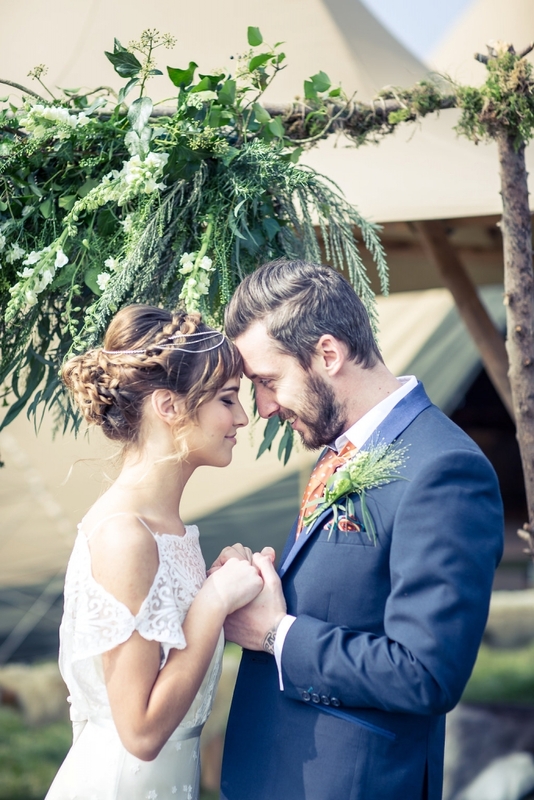 The second bouquet (seen with bride in open field) was created by Jessie from West Dorset Wedding Flowers. 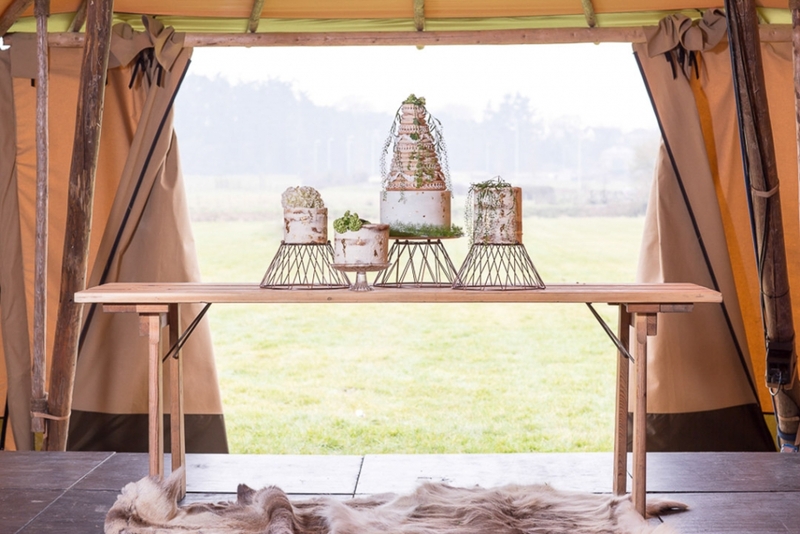 It has a more textural boho style with scented jasmine tendrils, rose gold sprayed succulents, spring hellebores and a tillandsia air plant. 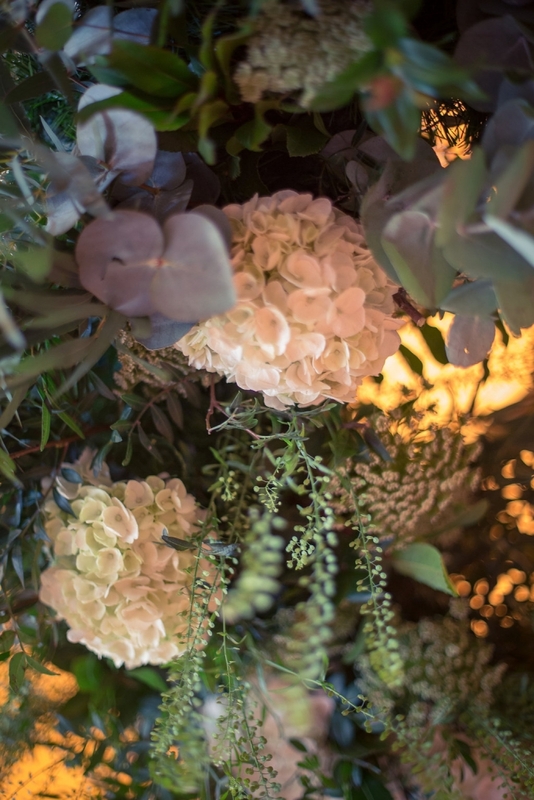 The paper flower adornments in the snug were created by Kat at The Paper Florist. 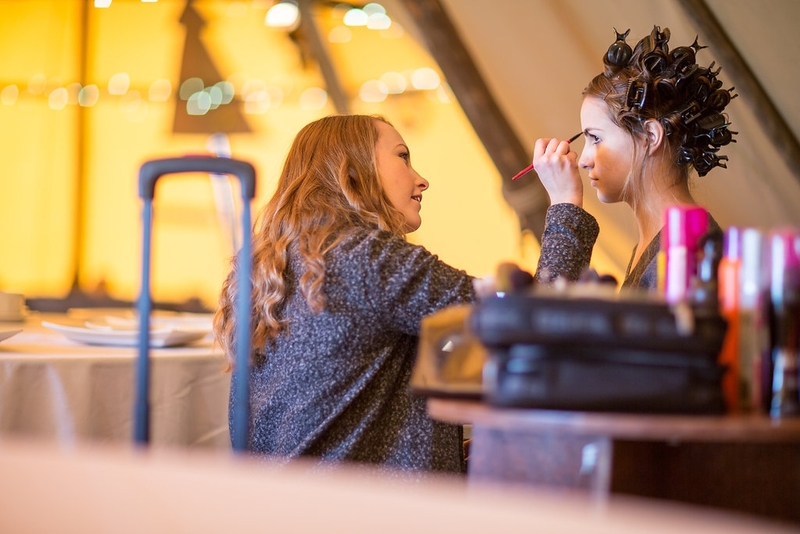 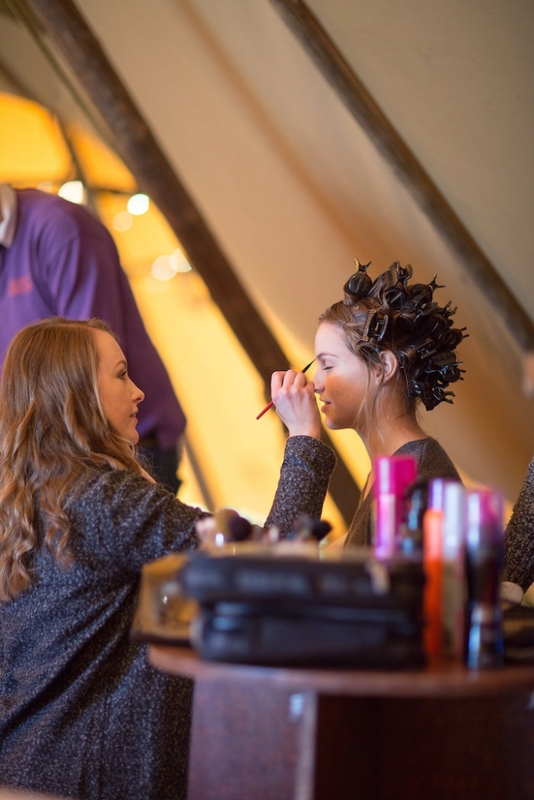 The hair and makeup, executed to perfection by Gemma and Giselle at The Event Studios, combined a neutral palette and an unstructured up do to give a laid back and relaxed look for our stunning model Jess Townsend. 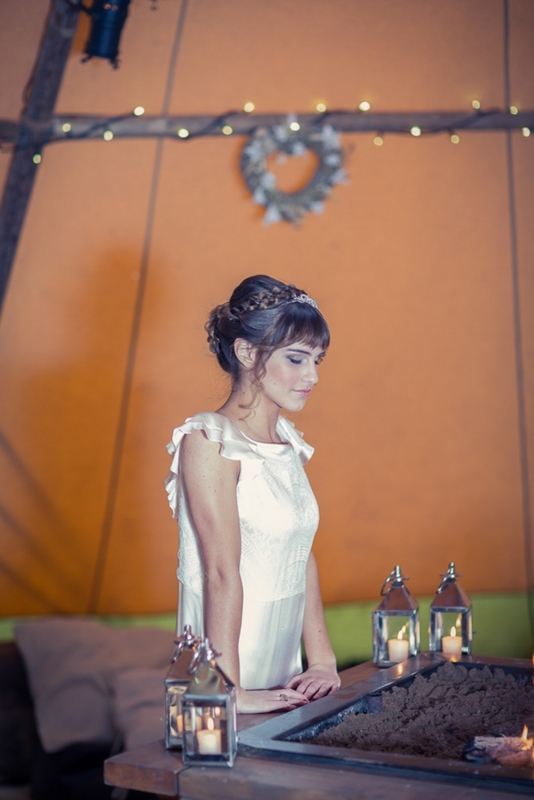 Lucky Sixpence provided the hair pieces combining vintage pieces to create individual accessories that teamed perfectly with the whole look. 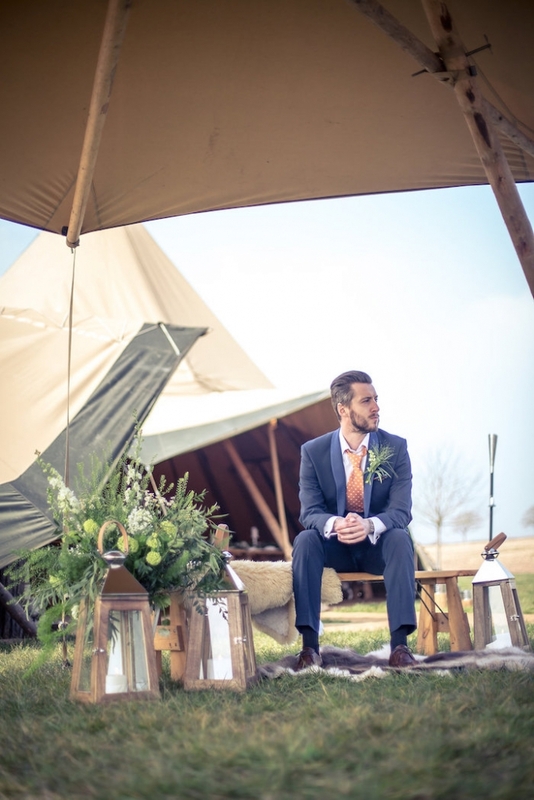 Our groom, model Jim Codagan, wears a stunning 3 piece suit and tie provided by Daw and co which draws on historical references with the on trend horseshoe waistcoat but bought up to date with a slim fit on the tailoring and contrasting blue tones. 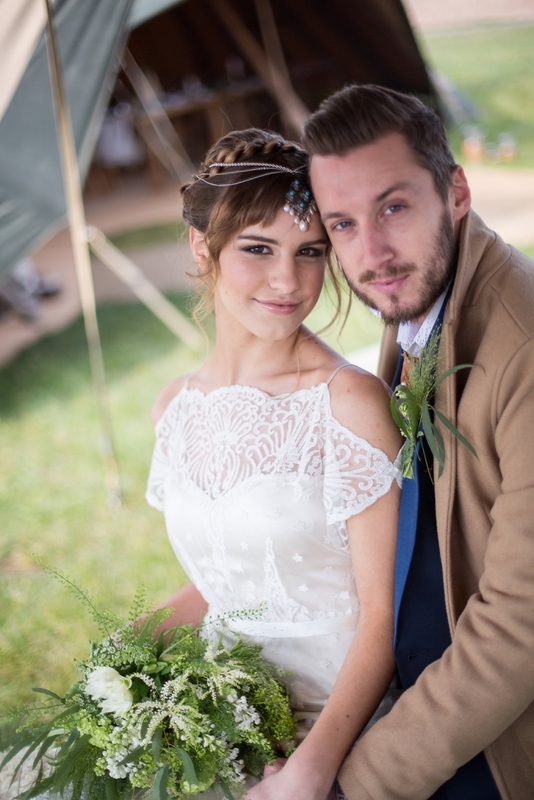 The lace tulle dress provided by The Ivory Secret was exactly what I wanted for this shoot. 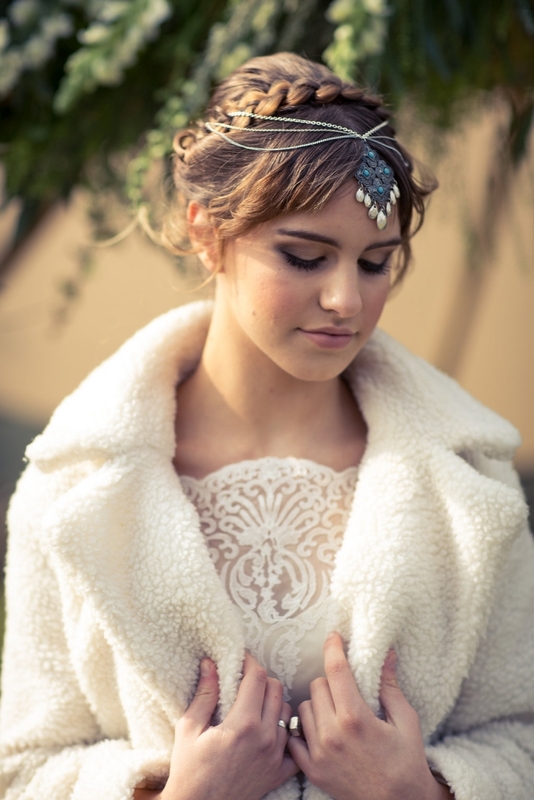 Its gentle fit and sheer layers with unfussy details was simply gorgeous and the whole mood of the shoot was complete. 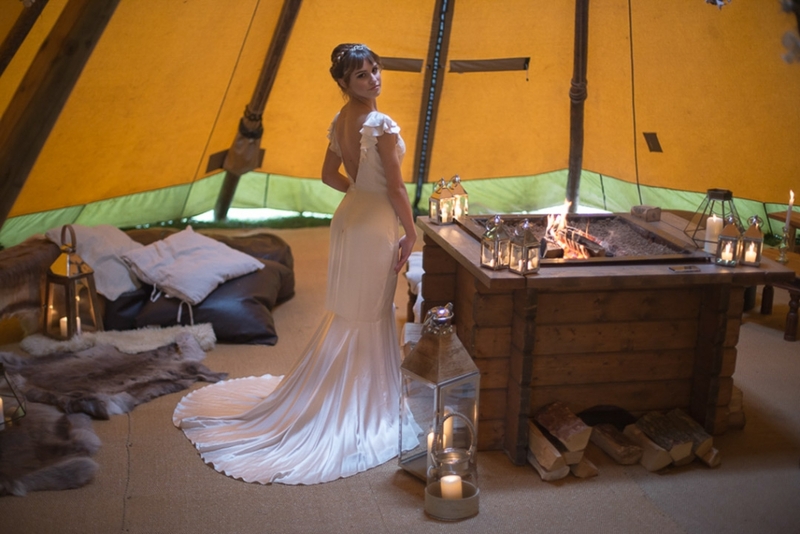 Our backless and fluted dress was provided by Pirouette and again gave a simple silhouette that suited the whole concept inspired by the tipi vibe! 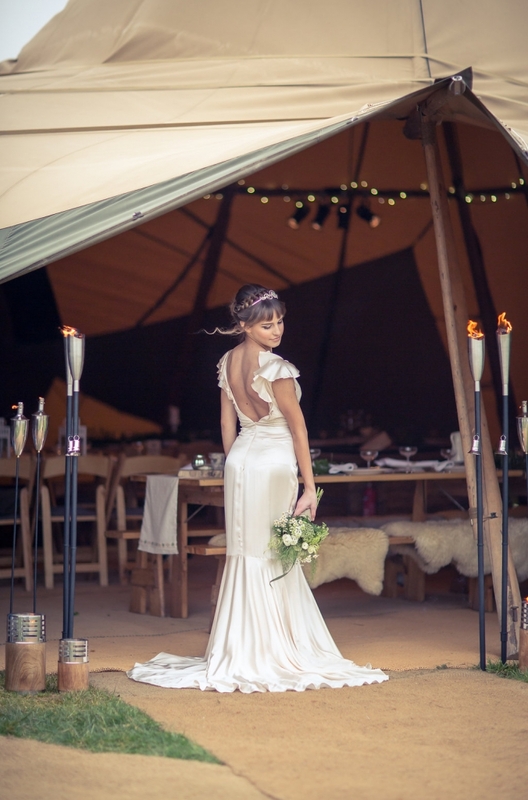 The Ivory Secret are Devon stockists for the Belle and Bundy range of gowns. 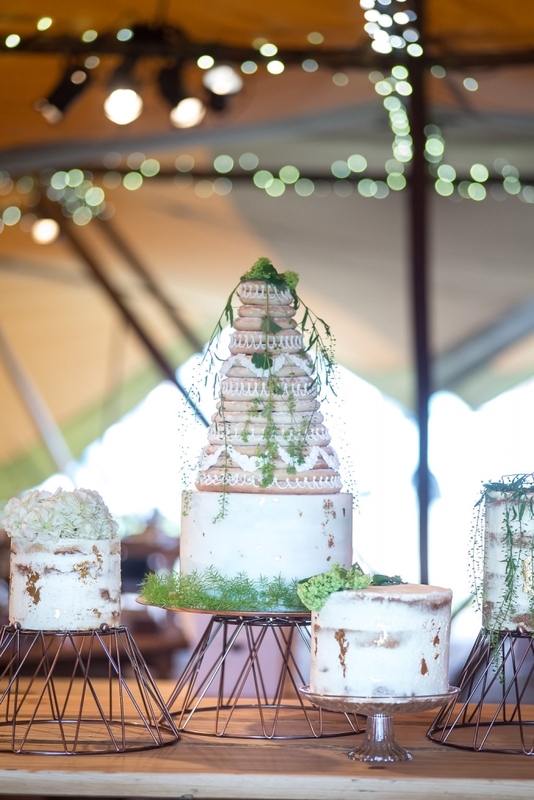 Our cakes were conjured up by cake couture genius Jennifer at Edible Essence Cake Art. 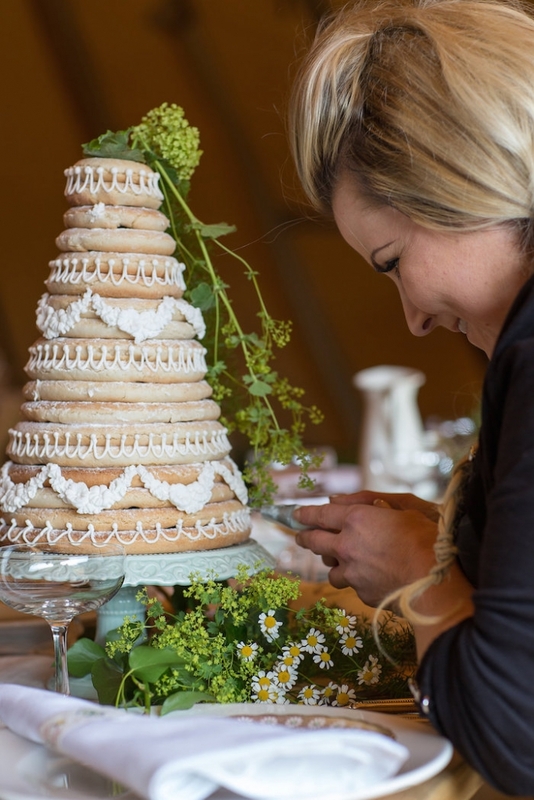 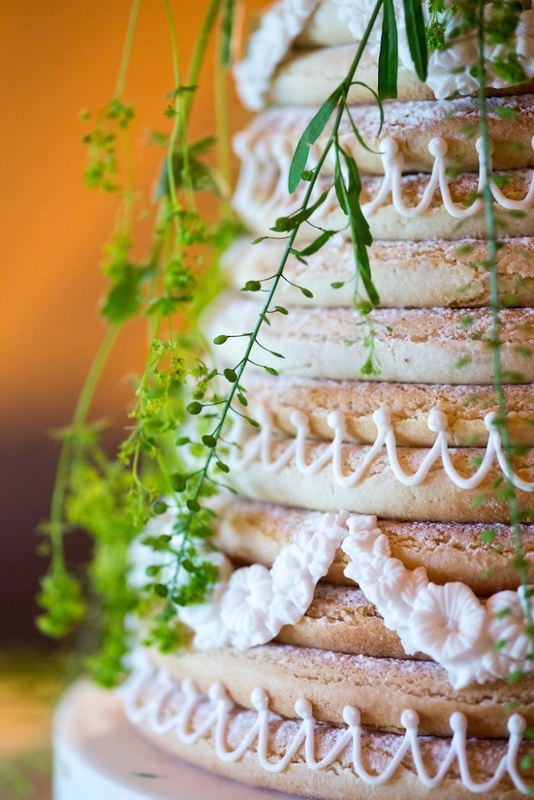 I had seen images of the Nordic biscuit cakes and fell in love so I was delighted that my request was granted and we had one on the day embellished in hand finished icing and tendrils of greenery. 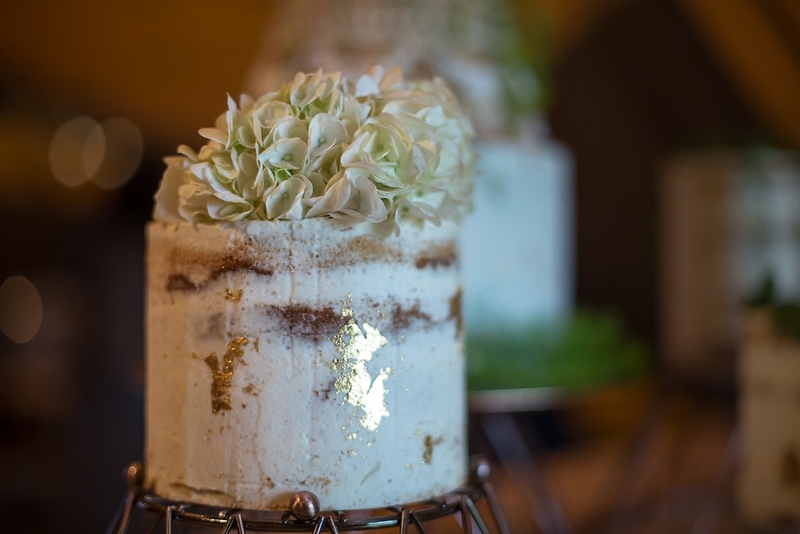 A selection of cakes all with a variation on the theme is ever popular now with guests, providing a choice depending on taste. 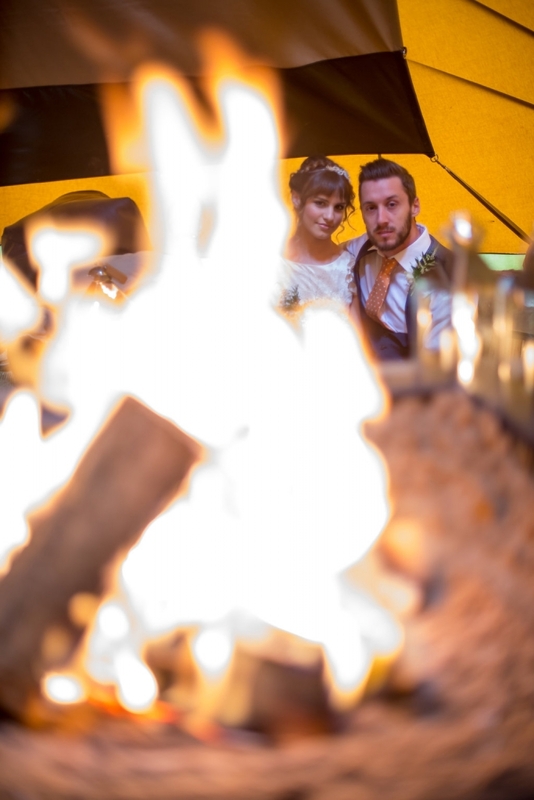 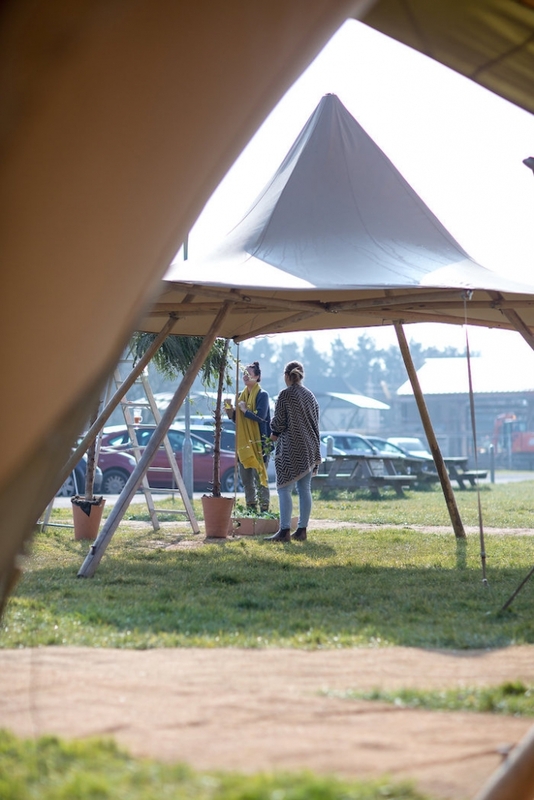 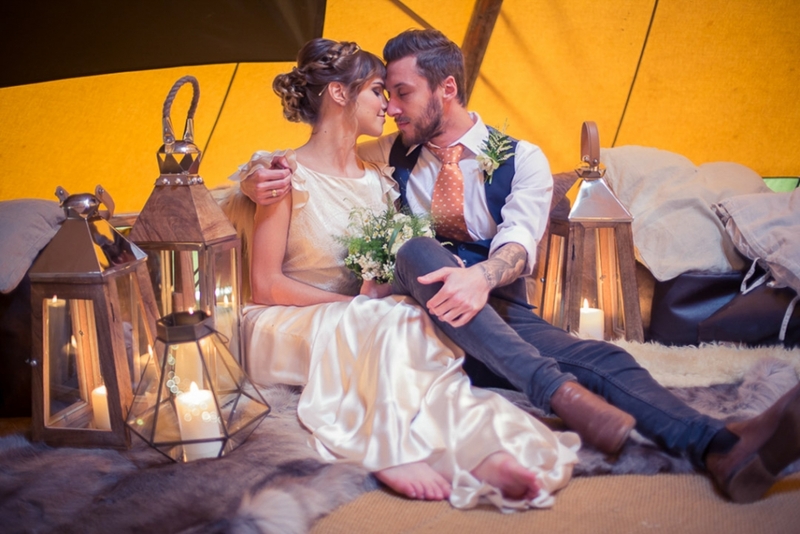 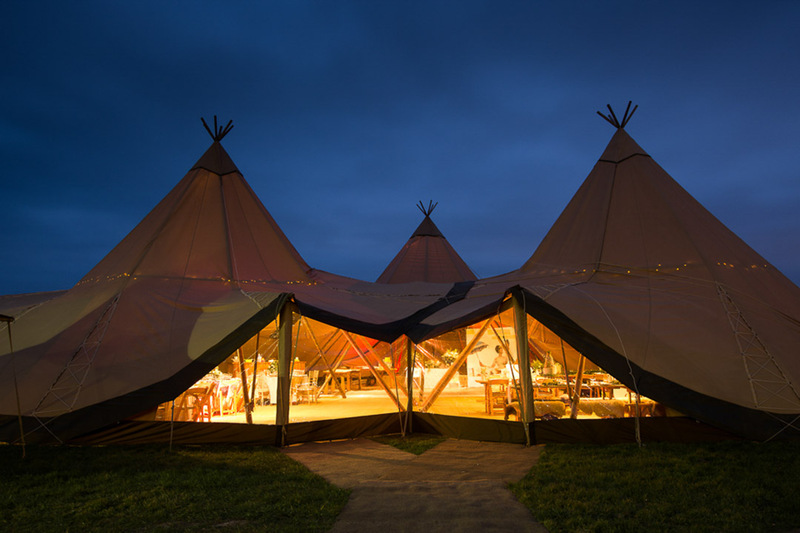 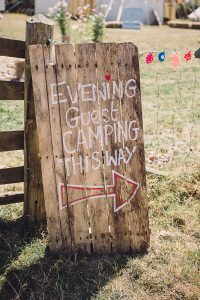 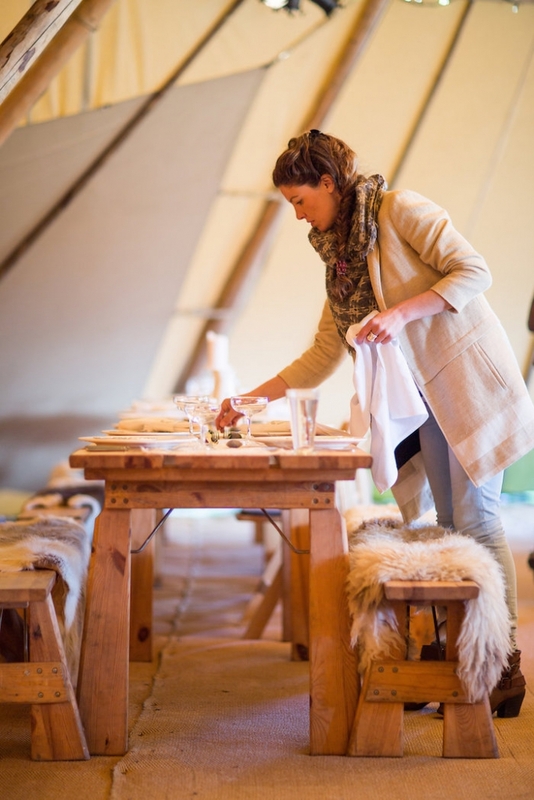 The furniture, fire pits, fairy lights and sheep and reindeer skins were all supplied by World Inspired Tents. 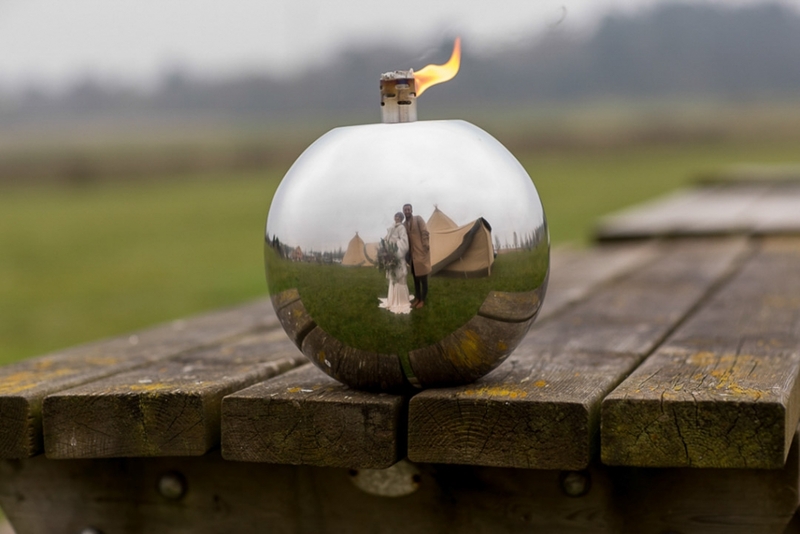 The oil lights and lanterns were all supplied by Zaza Home, and gave an extra element of drama as evening fell. 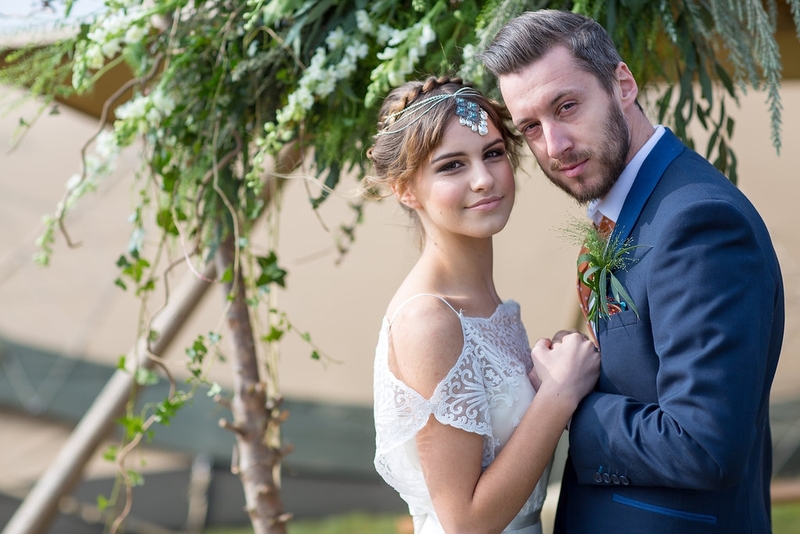 Our talented photographer on the day was Thomas Frost who we felt would capture the pure, relaxed and natural elements of the shoot perfectly and he has bought the images together showcasing all our suppliers at their best. 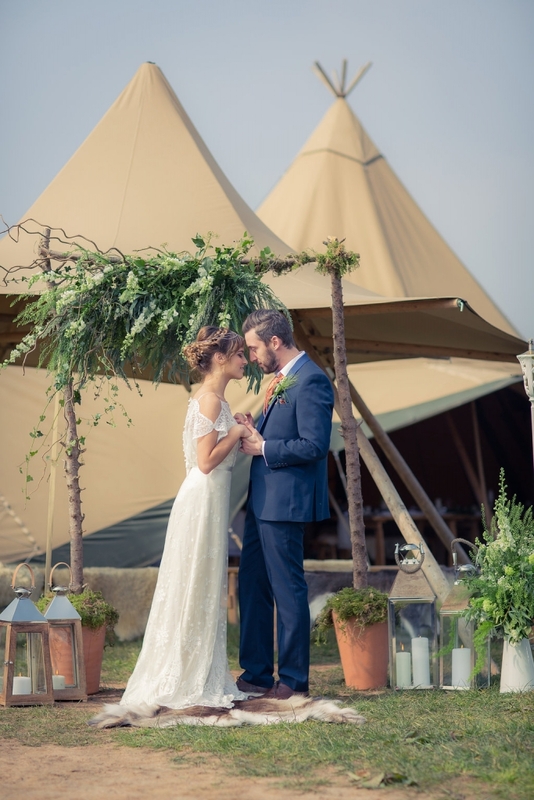 Thank you Thomas and our wonderful team on the day! 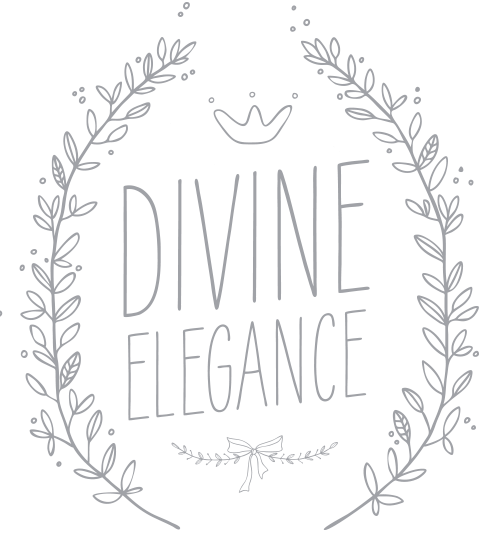 Simply sensational.